Last night I rushed home from work to help out with getting the babies to bed and giving my in-laws a taste of what it's like to have dinner at 9:30 PM. During the day it seems that Jen's mum and sister had a good time allowing the babies to play in their luggage. 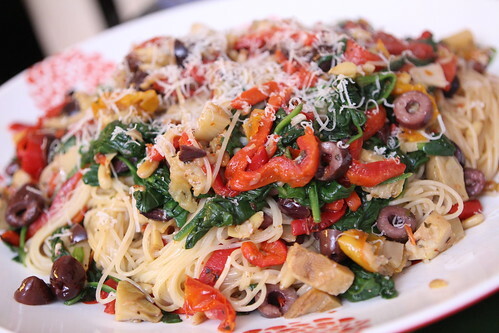 I quickly put together this pasta with cappellini, garlic, kalamata olivers, roasted red peppers, artichoke hearts, roasted yellow tomatoes, toasted pine nuts, fresh spinach, and Parmigiano-Reggiano. For beer I had this Blonde on Blonde pale ale from City Steam Brewery. It was hoppier than I expected after seeing the word "blonde" bandied about on the label. I had been expecting it to taste more like a blonde ale and less like an IPA. 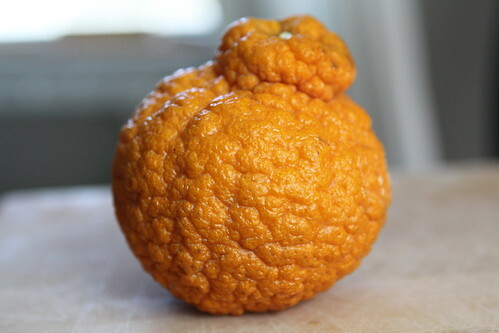 During the morning we gave them their first taste of Sumo tangerines. It's hard to rank this one because they didn't actually eat it, they just sucked on the pieces in their mesh baggy. It was definitely a huge hit. What remained int he mesh bags after they were done looked like the remains of some crazy science experiment designed to remove 100% of the moisture from organic matter. 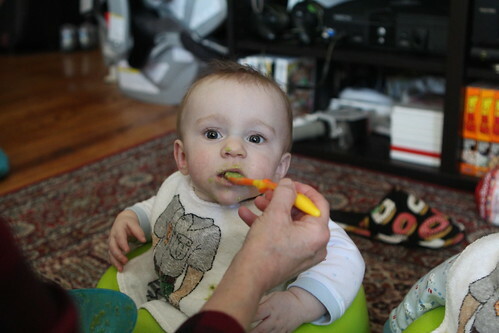 After the Sumo incident we fed them their lunch of mashed peas and avocados. They really loved this one. Jen actually liked it even more than them and seems to have plans to make it for herself for dinner soon. 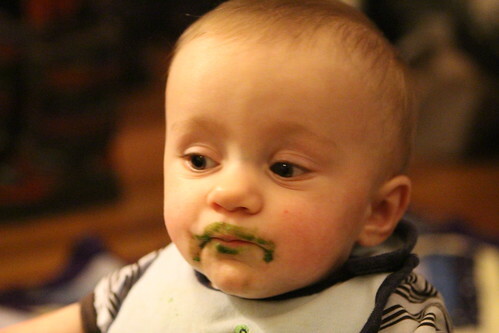 They seemed to hate peas so it could be the addition of one of their favorite foods that made this one a hit. 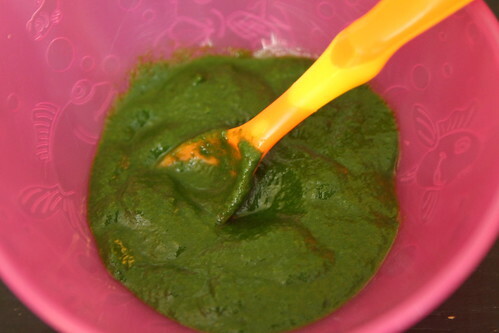 For dinner we gave the babies their first taste of spinach. I cooked a little extra when I made dinner last night but I did not have high hopes. All four of us pretty much figured that this would be a huge disaster. 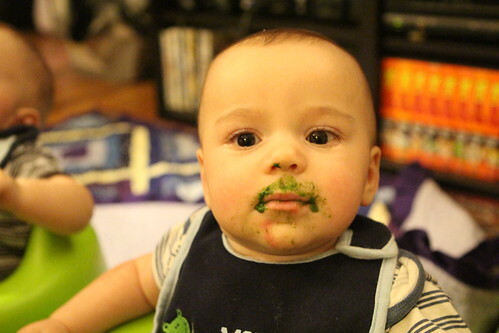 * frozen The best side effect of spinach is that it made the babies look like they had awesome little mustaches. Martin had a Frank Zappa style mustache and goatee while Elliott looked quite a bit like his Grandad . . . or some randome midwestern sports fan. 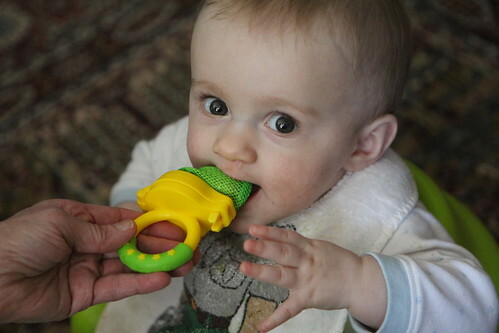 For dinner, the babies stayed up quite late with us, and I decided that having guests would be a great opportunity to clean out the fridge and freezer I would cook a special selection of dishes for Grandma and Auntie Lauren! 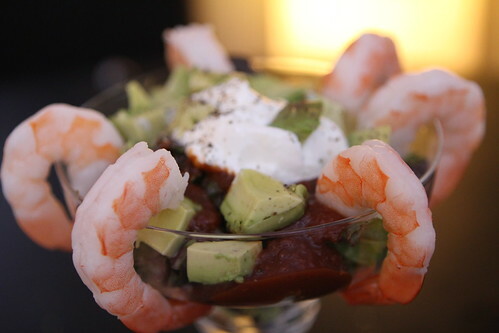 I made this cocktail shrimp with lettuce, cocktail sauce, sour cream, and avocado. 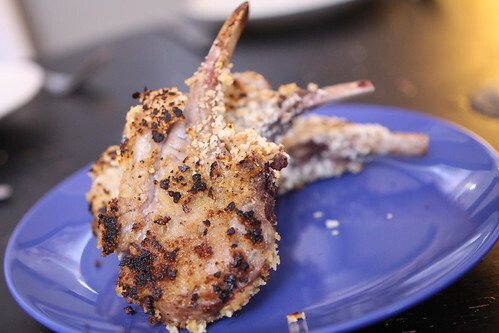 Lamb chops crusted with horseradish mustard, coated in bread crumbs, seared in a pan, and finished in the oven. 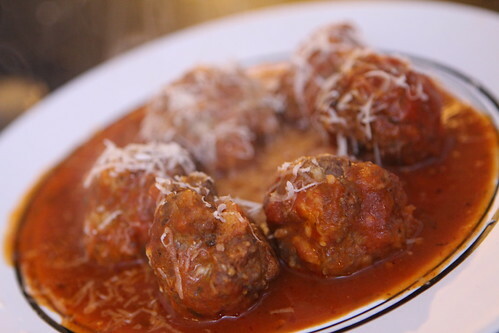 Meatballs with marinara and Parmigiano-Reggiano. Jen accidentally pulled these out of the freezer to defrost so we needed to do something with them. What better than to serve to our guests? 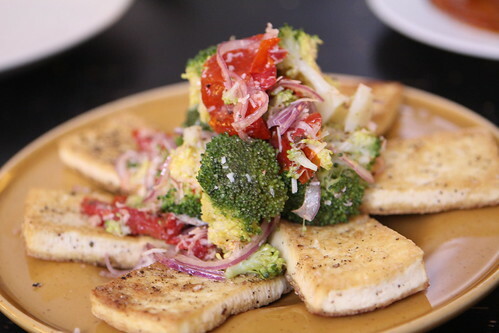 Pan seared tofu with a salad of broccoli, red onion, roasted tomato, lemon, olive oil, salt, pepper, and Parmigiano-Reggiano. 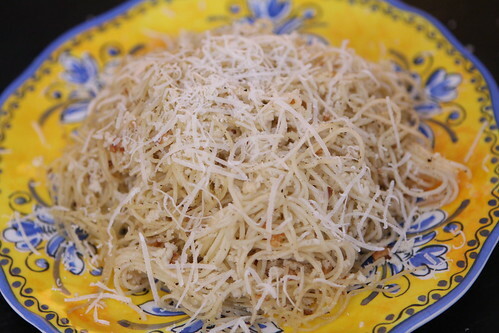 And Roman style cappellini with olive oil, butter, garlic, bread crumbs, and Parmigiano-Reggiano. On their last night in New York we decided to really treat Jen's mum and sister to a rockin' good time. 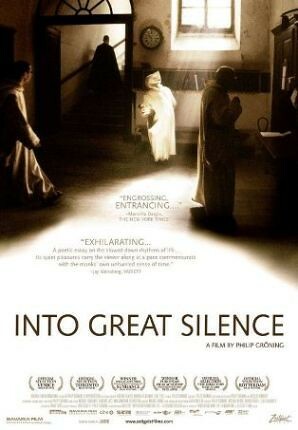 So it was that we decided to watch the documentary Into Great Silence about Carthusian monks in the French Alps. The maker of the film asked the monks if he could film a documentary in their monastery and they told him they needed some time to think about it. Sixteen years later they responded and said that it would be okay. The film is mostly silent since the monks have taken a vow of silence. We figured that watching a three-hour-long silent documentary about monks would be the ultimate way to end their trip to New York. What can I say? We know how to party it up proper! As we watched this I felt it was appropriate to have a monastic-type beer. 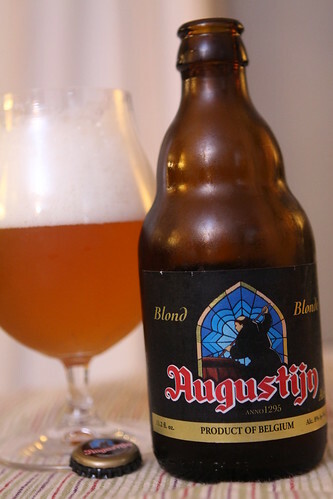 That's why I reached for this Augustijn Blonde from Brouwerij Van Steenberge which my parents got me for Christmas. Sure it's not actually made by monks but it is made in Belgium and it does feature a dutiful monastic figure on the label tending to a mash tun. That's got to count for something. Lauren pretty much hated every second of this movie. She was too confused about why the monks were silent, why it was so slow-paced and boring, and why there was no dialogue. Since we had just watched an incredible, thought-provoking movie we needed to pick something else for the double-feature. Something that would be the complete opposite of the movie about monks. 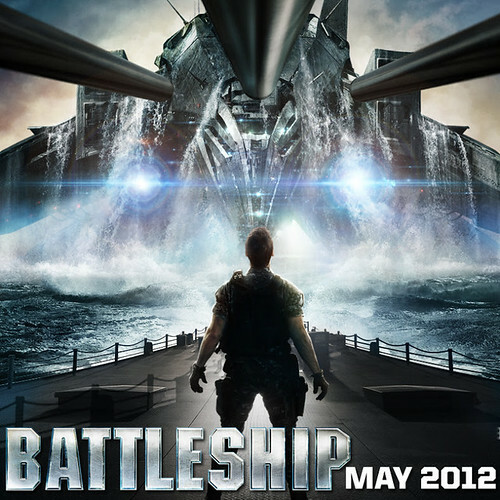 I think I'd rather watch about a hundred movies about monks then watch this travesty. Lauren and Grandma were happy though because there were plenty of exploding water spouts. That movie about the monks sounds AWESOME! I've put it in my Amazon shopping cart. It was pretty great (if you don't ask Jen's sister). I think you'll be glad you watched it!